Apsaras, the woodland spirits that were a part of the Khmer primitive animistic beliefs, were the origins of this now famous Cambodian Royal Ballet. The Apsaras you can see adorning the Angkor temples in Cambodia became the permanent choreographers, avoiding Balanchine creativity for perfect imitation of the most intricate of gestural movement, each hand and head, body, leg and foot manifestation expresses depth and meaning. The resulting movements are captivating and engaging as they re-enact the mythical and legendary Churning of the Milk, the battle of the gods and demons for the elixir of immortality or scenes from the Indian epic, Ramayana. ​Yes, there was a time (around the first century) when the Angkor kings adhered to Brahmanism and until now, such influence is still seen in many Cambodian rituals. ​But most of all, it's a dance drama, not boring. It can be energetic or intricate and the costumes alone set the stage on fire. Dressed in silk tunics and skirts with elaborately adorned head dresses, the performers come in four: the male and female dancers, the monkey and the giant. It is easy to follow the story based on the epic, Ramayana. Hanuman is the monkey deity known for his extraordinary courage and selfless service. It was said that Hanuman was the son of Anjana, the Apsara who was transformed into a monkey by a curse from the wind god, Vayu. Hanuman was a bit naughty as a boy and enjoyed pulling tricks like dousing sacred fires or creating whirlwinds or just flitting about, all movements easily captured and exaggerated in the dance. So, finally the gods asked Brahma to sort Hanuman out. Brahma removed Hanuman's knowledge of his powers. But as in most great epics, the hero ends up in a victorious feat which becomes the climax of the many Apsara re-enactments of Ramayana. The triumph of mischief is always good fun. Apsara was widely popular during the Angkorian era. As you go through the halls of the temples of Angkor, you can see images of these partially clad beauties adorning each alcove and cranny. It has been written that there were around 3,000 Apsara dancers in the court of the most powerful Angkor ruler, Jayavarman VII who ruled in the 12th century. Records show that the Apsara Dance was already practiced in the 8th century. ​There are different versions of who the Apsaras really are. Some divide them into the heavenly ones and wordly ones. In fact, they have lists of names of Apsaras and interesting stories on them. They are often referred to as guardian angels, wives of royal court musicians, lesser goddesses, nymphs and what have you. ​The fact that they existed cannot be denied. The statues are well entrenched not only in the Angkor temples but other temples in India, Indonesia and Thailand. If you understand the meaning of the movements and the costumes, you will have a more enjoyable experience. ​The costumes are close to the Khmer traditional costumes except that the color must be closer to the skin to symbolize the woodland spirit so you see the dancers wear tight fitting skin coloured tops. Usually the white skirt is for the main dancer with the subordinate dancers wearing other colors. ​The head dress for the main dancer is with five tiers and the minor ones just three, following the depictions in Angkor. This dance nearly vanished until some experts studied the gestures in the Apsaras of Angkor and reconstructed this ancient intangible heritage. Some of these finger movements represent offerings of flowers, leaves and fruits to the gods. Through these gestures, the Apsara dancers carry the wishes of the Khmer kings to heaven. Kids are often chosen at an early age and suppleness and elegance of their hands is of utmost consideration. These kids when chosen start school at the Phnom Penh School of Fine Arts which has taken over the responsibility of training future Apsara dancers. They start with exercises to train the hands, feet, and body in the movements of the dance. They are also given the regular school lessons so they get their general education. Today, with the tireless commitment of Princess Norodom Bopha Devi, the Apsara dance is taught at the Secondary School of Fine Arts and continues to be performed in the Chaktomuk Theater. This prestigious free school accepts 50-60 new students each year. Half of these quit in their second year as the lessons require perseverance to complete the 9 years. Judged on their appearance, physical qualities and motivation, these students practice dancing from Monday to Saturday and then spend the afternoon for regular classes. Why so long? Khmer classical dance of which Apsara is only one, demands extreme discipline in holding poses, arching backs and twisting arms and feet in difficult positions. And at the end of these arduous years, your salary is around $40. Overseas tours pay about $30 a day. Some of those who are still dancing, support their interest for their heritage by engaging in small businesses such as a tailoring shop or a beauty salon. Performances now proliferate in Phnom Penh and Siem Reap. A visit to Cambodia without seeing some part of the Apsara art would be just half a visit, so check carefully with your hotel for the next, nearest performance. 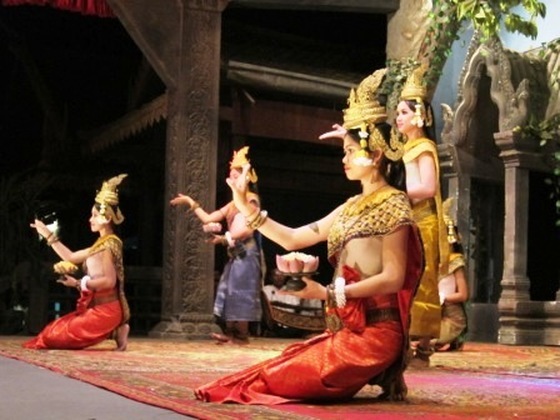 The Apsara dance practiced by the Khmers since the Angkorian period only became world renowned when the Cambodian royalty took interest once more in this great inheritance. ​Queen Sisowath Kosamak Naryrath saw the students of Sothearath primary school perform the Apsara dance during an awards ceremony to which she was invited. She hand picked the most likely young dancers from surrounding primary schools who had the requisite flexibility and athleticism. Apsara movements require anatomy challenging stretching and bent-backward gestures which are better learned early, sometimes as early as five years old. These kids were trained in a school inside the palace and the Royal interest gave awareness and pride in Apsara dance a renewal that exploded with the inauguration of the World Art Festival in Singapore in 1977. Princess Norodom Bopha Devi, the daughter of then ruler, King Norodom Sihanouk performed as the prime ballerina of the acclaimed Cambodian Royal Ballet. In the past, the Apsara dance was only performed for royalty. 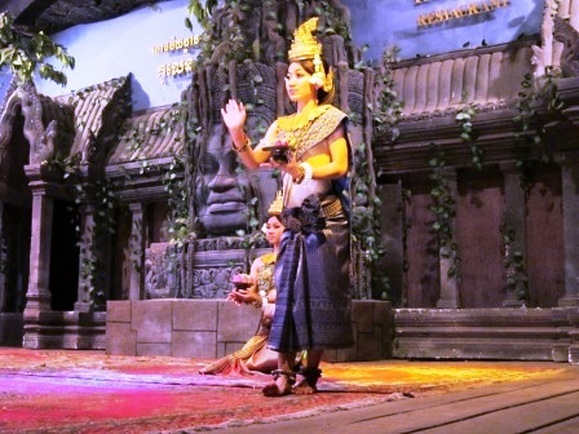 Today, it is performed for everyone to the delight of the Cambodian people who now can rediscover their own heritage. ​Today, these Apsara dances in all their richness and magical variations are still performed during rituals and ceremonies. The shadows between wood nymphs and reality, between the present and a magnificent history shift and blend and you need to pinch yourself to remember where you are. Visitors, of course, can get a hint of the real performances by watching stage shows as part of dinnner buffets in many restaurants in Phnom Penh and Siem Reap. ​There are some local theatres tied in with dance schools that try to do the more traditional dances, so look for these and see the real thing if it catches your sense of history. These performances are easily arranged through your hotel or guide. They can easily reserve the tickets for you and also bring you to the place. It is often accompanied with a buffet dinner. You can often go up after the performance and have your pictures taken with the performers. ​Because of the expanse of the Angkorian empire at the peak of its power, it is not unusual to see similar Apsara performances in Thailand, Laos and even Vietnam. A stay in Bali will also bring back Angkorian memories. The intermingling of cultures during the ancient times, when kingdoms merged by marriages or military victories, was inevitable. The beat of one Kingdom was taken up by the invaders and the invaded and absorbed into their own legends. Thanks to this international NGO, Amrita, Cambodian classical dance did not just remain in the museum of culture. It must be noted here that many Cambodians have not really seen this Apsara dance performed before because most perfomances were only for the King so unless you are part of the royal court, there was no way you would have a chance to watch these. Then, during the Khmer Rouge period, many of the artistic masters were killed, almost 90% of them, leaving a big gap in the performing arts. Amrita is now helping the young Cambodian artists take what is of great value in the classical performance arts and moving it to the future using their own creative talent. The founder, Fred Frumberg, first came to Cambodia with UNESCO to revive and preserve Cambodia's legacy in the performing arts. To sustain this initial effort, Frumberg organized Amrita and today, it is helping the Cambodian artists in their creative effort. UNESCO, in 2003, recognized the Apsara Dance as a "Masterpiece of Oral and Intangible Heritage of Humanity”.